Kinetico Premier Series with AccuDial – Commonwealth Water Treatment, Inc.
Kinetico Premier Series with AccuDial water softeners are the ultimate water conditioning solution. Knowing that water and electricity don’t mix, it just makes sense (and is brilliant) that these systems operate without the use of electricity. 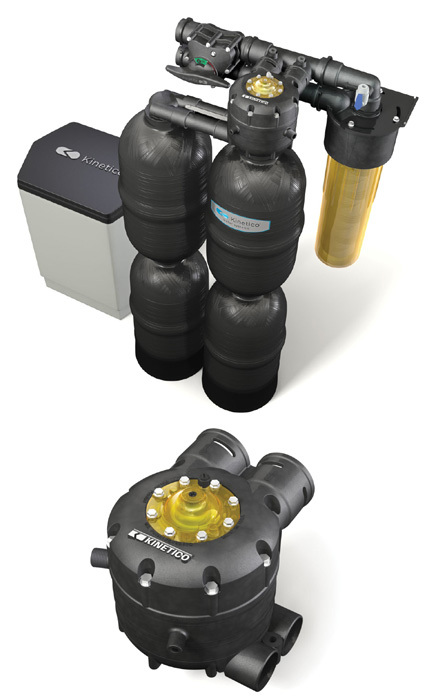 Engineered to tackle your tough water challenges, Kinetico Premier Series with AccuDial water softeners work more efficiently and reliably without electrical components or computers that need to be set, adjusted, repaired or replaced. Our patent-pending AccuDial™ feature allows more precise calibration of the system to your home’s specific water conditions for optimum efficiency, saving on operational costs and eliminating waste. In essence, it’s like having a water softener that’s custom-fit for your home. Designed with today’s demanding households and larger plumbing in mind, Kinetico Premier Series with AccuDial softeners deliver generous flow rates without forfeiting water softness. And the multiple tank system design assures you have around-the-clock soft water, even during the regeneration (cleaning) process. One tank is always in service while the other tank is either on standby or regenerating. Kinetico Premier Series with AccuDial systems regenerate at any time of the day or night to ensure you will always have a supply of soft water. Single-tank systems simply can’t offer this. So if you have a house full of guests or are running multiple loads of laundry, you’ll never run out of soft water. And if you’re away from home, the system stays ready without wasting water or salt. Whether your water comes from a well or city supply, our Kinetico Premier Series with AccuDial water softeners are engineered and built to take on the toughest challenges you’ll find. Choose from models that also remove iron, chlorine or particulates as they soften. Commonwealth Water Treatment can recommend the system that will work best for you. We’re so confident our Kinetico Premier Series with AccuDial systems will perform beautifully for years and years that we back them with the most comprehensive, flexible warranty you’ll find.